One of the most widely used retirement savings vehicles in America is the 401(k). That is not too surprising since millions of working adults have access to these defined contribution (DC) plans through their employer. However, 401(k)s are also very popular because many Americans can recognize the value inherent to these plans. For example, more than half of surveyed U.S. adults in an earlier Natixis Investment Managers study said that one of the top reasons they utilize an employer-sponsored DC plan as a savings tool is because of the tax benefits. Some lawmakers in Washington, though, have debated whether this key feature should be eliminated in order to boost tax receipts (government revenue). Such a change would likely not be well received by participants and even prove to be detrimental to their retirement security because nearly a third of survey respondents said that they would decrease their contribution rate or drop out of the DC plan altogether if the tax benefits were no longer available. Another savings incentive associated with 401(k)s is the employer match. Indeed, many companies will make matching contributions, up to a certain level, which can significantly boost a participant’s rate of retirement saving. Not all employers offer a match but among those surveyed workers fortunate enough to have this feature, 63 percent said that it is their number one reason for participating in the company’s DC plan. In fact, almost half (48 percent) of surveyed employees who do have access to a basic DC plan but choose not to participate said that they do not partake in their company’s plan because their employer does not offer matching contributions or the match that is available is not big enough to motivate participation. Further, nearly seven in ten participants reported that they would contribute more to their plan if their employer offered a larger match, and a fifth said that they would decrease their contribution rate if the match was reduced. 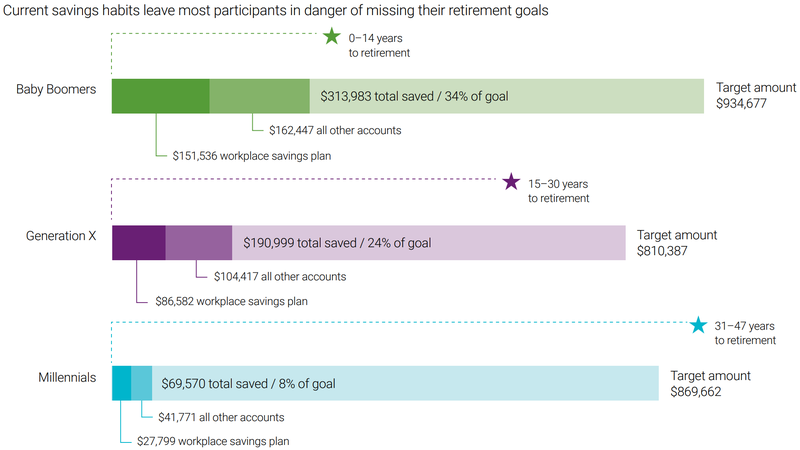 As for non-financial incentives, half of surveyed participants cited the convenience of an automatic paycheck withdrawal as a top reason for participation, and 39 percent said that saving through their company’s retirement plan is less complicated than if they tried to do it themselves. More than a quarter (27 percent) of participants reported that automatic enrollment is what got them started, while four in ten respondents who have access to a plan but do not participate said that they choose not to because they have too much debt that needs to be paid off first. Regardless of the reason for participating, it is important to do so because the report revealed that many Americans will need to have amassed a rather large nest egg in order to retire comfortably. Specifically, 90 percent of surveyed workers expect to retire at an average age of 63 with roughly 22 years of retirement to fund. Only half of those respondents said that they have an idea of how much money they will need to set aside to cover their old-age finances but on average the estimated figure was $878,206, a sum too many individuals are not on track to achieve (second graphic). Social Security could of course help partially offset a potential savings shortfall but overall only two-thirds of participants believe these government benefits will be available to them when they retire. Younger respondents in particular have little confidence in Social Security’s long-term viability, which only increases the importance of maximizing their contributions to every tax-advantaged DC plan at their disposal.